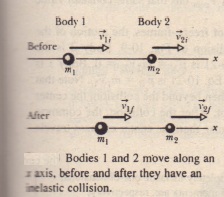 Shows two bodies just before and just after they have a one-dimensional collision (meaning that the motions before and after the collision are along a single axis). The velocities before the collision (subscript i) and after the collision (subscript f) are indicated. The two bodies our system, which is closed and isolated. 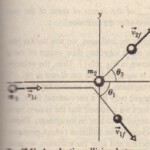 We can write the law of conservation of linear momentum for this two-body system. Because the motion is one-dimensional, we can drop the overhead arrows for vectors and use only components along the axis. Thus, from p = ml’, we can rewrite . If we know values for, say the masses, the initial velocities, and one of the final velocities, we can find the other final velocity.